ROAD TOWN, Tortola, VI- Premier of the Virgin Islands Dr The Honourable D. Orlando Smith says it’s an undisputed fact that expatriates have benefitted from being in the VI and that the territory is a much better place because of the over 100 nationalities who have made the territory their home. 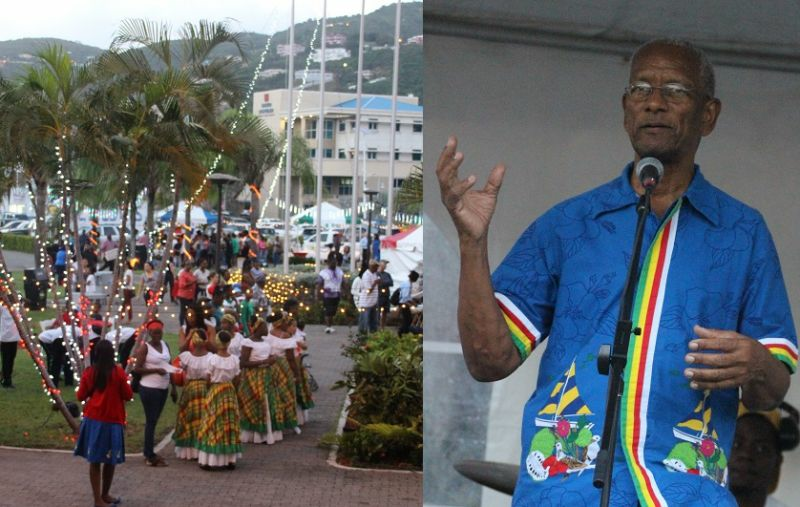 Premier Smith was addressing the 4th annual Premier’s Christmas around the World, celebrated under the theme: ‘Many cultures-One BVI’ on Saturday December 17, 2016 at the Central Administration Complex in Road Town. “We have over a hundred nationalities in the BVI, all of whom have contributed and benefitted from being in the BVI. It is because of all of you that the BVI continues to have a strong economy, it is because of you, that the BVI continues to be one of the leading financial services jurisdictions, and because of all the people who live here the BVI continues to be one of the best destinations for tourism,” he remarked. Premier Smith also stated that he would want the yearly event continued. “So I think it was fitting that we should all get together and celebrate together as one people here in the BVI. I have been doing this [Christmas around the world] now for four years and it is an event that I would like to continue because I think we all continue and we all need to get together and be able to celebrate together and appreciate one another as a people,” he added. Meantime, Permanent Secretary in the Premier’s Office Mr Brodrick Penn promised that the event would be a real treat, and it was! The music, food, dress, language, and hospitality of Antigua, Dominica, Dominican Republic, Lebanon, Jamaica, Montserrat, St. Lucia, Philippines, Germany, Dutch St. Maarten, Grenada, BVI, St. Kitts and Nevis, were on display at its best. There were also performances by the Mount Carmel Baptist church, BVI Dance School, medley Selections and skit by all participating countries, Foggy Mountain Boys and B'More. The High-Frequency band provided the music, DJ Paid Fa pelted the tunes, and Mrs Arliene T. Penn was the host. Face painting, lucky dips, selfies with Premier and storytelling were other activities. “It’s always so wonderful to see so many people from so many places gathered at this function. The Premier’s Office is especially proud to always put our best foot forward and to come together with all of you to celebrate what it really means to be to share love and blessings throughout Christmas,” Penn said. The event started at 5:00 P.M. and ended at 10: P.M. True that... To go further enough votes to put Any government they want in power. Locals have been left in the dust and now have no place, nor rights, in our own country. Premier spreading false propaganda once again. What strong economy? Where? And B. Penn did not even list the BVI in the line up of real treats. That's how far forgotten we Locals are in you'll minds and thoughts. We Locals have sure taken a considerable amount of ABUSE under this NDP gang and their elfs. Misery Guts! It was a lovely evening and there were far more BVIslanders than foreigners present! @lodger - in the backseat like always of course. We are still trying our best to atleast appear relevant before we local completely become extincted, a rare breed now indeed amongst the midst. Follow the votes. That's what a smart Politician does. On elections day it's all about votes and not who or where they come from.. Don't mine the talk.. They can't stop NDP.. We just need some ministerial shuffle.. Put Myron in Health and enviroment....Marlon in labour and Agriculture...Alvera in Social development and Culture.. Need some new blood. New ideas to revive those departments...Time for Ronnie and Smith to take a back Seat... Premier can be Mark or Kedro any one is good. I think mark will make a great Minister of tourism and Kedro will make a great Minister of education.. We switching up for better results. NDP all the way for 2019..
@Can't stop NDP. And they will be! Period! Full Stop! @The NDP and Their Gangs Need to Go! The whole set of exceedingly greedy NDP and their money-sucking gangs need to go before they destroy us all. They don't need shuffling. They need Investigating. That's what they need. Too many ties and secrets, and operating right infront of our faces- like a sown-to-secrecy mysterious Cult. No doubt expats have contributed and benefitted from and so too has the BVI benefitted from their (expats) presence the BVI. Too often though, the impression is communicated that expats contributed much and the BVI contributed nothing. Here is a news flash just in case there were any misunderstandings. Both (BVI & Expats) were/are integral to the growth and development of the territory. Further, the 100+ nationalities gracing the BVI with their presence exposed the BVI to cultures, food, music, dress, customs....... etc that many of us probably would not have experienced close up. Moreover, Santa Claus is mystical and fairy tale figure around the world. No dis intended for Dr. Hon Premier but is the claims about the economy just an anecdotal tory or a deliberate intent to mislead the people on something that they know is not accurate. For example, just before the election the Premier declared that the economy was robust. Many residents still LOL about that statement. Now, he is claiming that the economy is strong. Clearly, again that is not accurate. Do not piddle on us and tell us it is raining cats and dogs. Just tell the plain truth. True, repetition reinforces learning and retention. Some politicians buy into the belief that the more often something is repeated the more believable it becomes. Stop the Animal Farm tactics. The economy has some challenges and a sizable % of residents believe that government is broke. The first order of business should be to build the electorate confidence in the economy and the territory. Building confidence in the economy and the territory is both for domestic consumption, as well as for external investors. More effort needs to be put into job creating jobs, investing in human capital, diversifying the economy, preventing rising crime, reducing the cost of living, building a first class infrastructure, improving education, improving healthcare, enhancing public safety, improving morale in public sector.......etc. Stop using tax payers money and paying this much rent.. Build another government building having our own is a great, great long term investment and also as we know construction energized an economy..
100 nationalities in a little 2x4 territory. That's what you call an invasion. We are not strangers in our own land. I really don't know why we expatriates does go out of our way to take part in BVIslanders affairs. They don't like us so to all expats let the premier and his BVISLANDERS do their thing, please stay away from their business. Persons who call themselves BVISLANDERS are so so negative against expatriates, it ain't funny. @ Expatriate, if you are so unhappy in the BVI, why don't you book a flight on LIAT asap and head out, putting the BVI behind you. Clearly, you do not have any love or loyalty to the BVI, that place at which you make a living to take care of you and your familiy. Now, you are encouraging others that thankful for the opportunity given to them by the BVI and want to meld into the community. We are now classified as strangers in our own land, and NDP don't give a Da$n. @Cow girl, I went through the same thing. Don't go back to the BVI, I thought about going back but, I move to Maryland from the State I was living in and everything turned out well. If I had moved back to the BVI, I would be going out of my mind. Go back home for what? Look at all the mess that is going on back there. @Cow girl, stay put girl, stay put. You move back, you will be pissed that you did. I went home for a two week visit, I left after a week. Honestly, I did not feel safe. I feel more safer living in the States. I am in the process of moving my Mother and Sister up here to Orlando Florida to live with me. And the NDP Gang can't even talk to any of the wayward youths on the street because they would want to know who they think they are talking too. Those are real signs of a government that has FAILED its People. Boy, things sound like its getting even more rough for BVIslanders than when I decided to leave because of victimization and oppression. Thank god I'm now doing well abroad and getting paid based on my performance and not on who I would have to brown-nose and pretend i like to get ahead. Not the NDP Representives alone all of the elected Representives are turning a blind eye toward the wayward youths. All I hear is complaining, complaining. Why don't you people grow up. @Island Man, I guess you have no reason to complain because you must be one of the puppets that is living high on the hog and getting fat like a Sumo wrestler off the perks. The Premier says the economy is strong. Is the Premier's life at the 30,000' level too high in the stratosphere to know what is going on the ground with the masses? Or he truly believes that all is well with the economy. Or he is playing psychological mind games with us as we are celebrating the birth of Christ. If so, physician heal thyself. Is the Premier's speech writers doing him a disservice with the pearls on the economy: the economy is robust, the economy is strong. Did not the Premier a few weeks ago in a national address on the economy told us that there were some challenges in the economy? Doc burst on the scene with some political capital (earned as a medical professional) and some street crews but he is losing stock in both quickly. Continuing with the cockamamy tory about the economy gives legs to the monikers: Sleeper, Dr. Know Nothing.......etc. Comon Dr! No more Pinnochios! How come no Canadians? Who use to have best booth, and NEVER any Americans???? ?